What is your interest for Esoteric Disciplines? Do you have any experience to share with Samasathi? Join the Samasathi School of Esoteric Disciplines (SSED) and subscribe to our Newsletter “Love, Light, Energy”. Samasathi is always happy to offer Courses and Seminars in any SSED taught discipline as well as to guide Spiritual Retreats: feel free to send him directly an email ! Do you want to become a Certified Organizer ? If you share our Vision (see “SSED”), do not hesitate to submit your application with a letter of motivation to Samasathi. We operate a revenue sharing arrangement with our Local Organizers: you will have the full responsibility of advertising Samasathi’s visit, booking a venue and collecting payments. SSED provides promotional material to support you ! Due to travel constraints and Samasathi’s heavy agenda, a six months notice is necessary: please register your interest in time. The following are all Affiliated Masters/Organizers to SSED and can be contacted directly for individual sessions or courses offered in their area or country of residence. 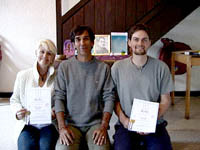 They have all personally been guided by Samasathi: do not hesitate to contact them.